OHNEP invites you to join Dr. Erin Hartnett, DNP, APRN-BC, CPNP, as a guest presenter for Practical Reviews in Pediatric Dentistry. Dr. Hartnett introduces the presentation “Building aCulture of Collaboration: Nursing and Dentistry” about how nurses are ready to step up to the plate for children’s oral health. On July 24, 2014, NYU faculty from colleges of Nursing and Dentistry, and School of Medicine participated in the interprofessional faculty development workshop, faciltated by Mayumi Willgerodt, PhD, MPH, MS, RN, and Amy Kim, DDS, from the University of Washington. The New York Nurse-Family Partnership Program Integrates Oral Health! The New York Nurse-Family Partnership (NFP) Program, a chapter of the National Nurse-Family Partnership Program, empowers vulnerable first-time moms to provide responsible and competent care for their children, and become more economically self-sufficient. Read more about The New York Nurse-Family Partnership Program Integrates Oral Health! On May 1st, NYU College of Nursing Master’s program held its annual Preceptor Recognition Breakfast and Development Day – a way to show appreciation to our colleagues for their professional generosity and dedication to our graduate students. HRSA Report, Integration of Oral Health and Primary Care Practice, was Released! OHNEP is pleased to forward the link to a pioneering, new HRSA report, Integration of Oral Health and Primary Care Practice. Read more about HRSA Report, Integration of Oral Health and Primary Care Practice, was Released! 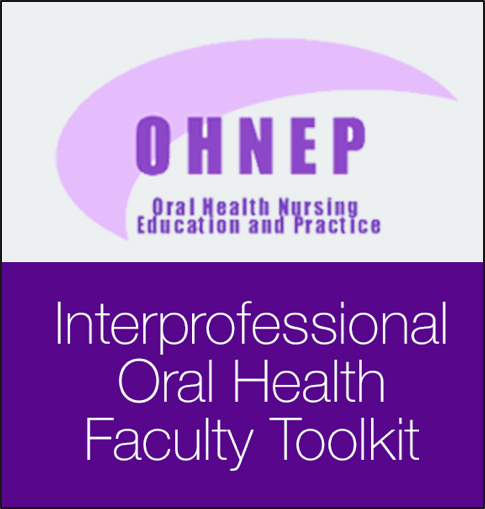 OHNEP is pleased to share exciting news about the recent Smiles for Life: A National Oral Health Curriculum update!